When most small business owners are asked to show their detailed marketing plan and budget … their eyes glaze over. That is not the number one priority in their daily efforts to attract, satisfy and retain customers. And yet, in the absence of brand awareness, significant new business opportunities are forfeited. In this article we’ll offer some financially painless solutions to ensure marketing awareness success … on a shoestring budget. Marketing – No Need to Break the Bank! Virtually all small/mid size businesses have an urgent need to create and maintain brand awareness … and lack a substantial budget to do so. Good news! It doesn’t have to be that costly. The key is consistency of look & feel and execution in being both highly visible and memorable. The following will walk you through a shoestring approach to build your business by building brand awareness. Your brand tells prospects, customers and referral resources who you are, what you do and what they can expect from you. In short, it is your “promise” in both image and deliverables. By way of imagery, consider this scenario. The year is 1721. You are aboard a merchant sailing ship carrying valuable cargo across the Caribbean. The sky is clear. The sea is smooth. Suddenly, you spot the masts of a fast-moving ship-of-war appear on the horizon. 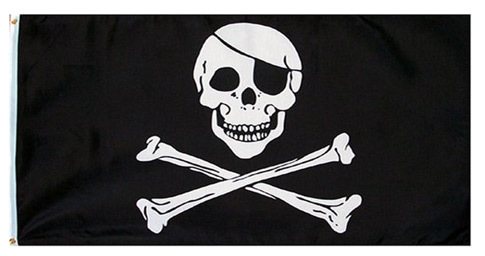 As it approaches closer and closer, you are able to make out the details of the ship’s flag. Three questions. Is there any question that the “brand” tells who they are and what they do? And does it deliver on the promise of what you can expect? Will it remain memorable? Bold Brands Win … Period! Our good friend, Dave Saunders, owns Madison + Main a branding marketing and PR Agency. His firm belief is the tag-line of his firm – Bold Brands Win … Period! Said another way (not a better way! ), a weak brand image is not memorable. Weak brands don’t inspire. That means that a weak brand image will not maintain top-of-mind brand awareness. Result: the weakly branded business will not be at the top of the list when a buying decision or referral opportunity surfaces. What’s the big deal about being memorable and maintaining top-of-mind awareness? Just the facts! 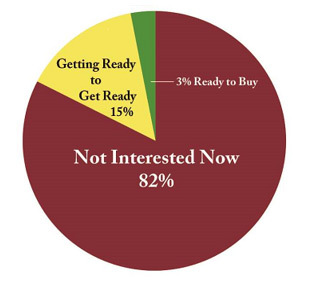 Studies show only 3% of your customers and prospects are ready to buy TODAY! The vast majority, 97%, are gonnabe buyers. Of course, you want to sell to everyone today … but that ain’t gonna happen. So your best defense is the strong offense of being memorable in the eyes of the 3% ready to stroke a check now. You will do that with a strong brand supported by a consistent image across all media in which you appear … from business cards to marketing collateral to your website and public appearances. Your branding formula is to include six critical pieces. Your company name, logo, tag-line, choice of type font, colors and consistency. Let’s take a look at each one. Tag-line: This is a descriptor of what you deliver. Keep it short and direct. Any of these ring a bell? “Don’t leave home without it.” “Are you in good hands?” “Just do it.” Click here for an informative article on how to craft a powerful tag-line. Fonts & Colors: People buy for what a product/service does plus how it makes them feel. Graphics and colors evoke emotion. Your choice of colors should be chosen to elicit the feelings you want to prompt. We all make our buying decisions emotionally … and later justify them logically. Consistency: This means that every place your brand is visible, it conveys the same all-of-the-above, whether the vehicle is your website, business cards, marketing collateral or advertising media. You may or may not likely be the designer of the color, fonts and shape of your brand. However, it’s valuable to know some of the basics as you may end up working with designers who are fine at their craft, but may not have experience in marketing and branding. So here’s a brief bullet point recap of the importance of your choice of colors, fonts and shapes. Color: Nearly 85% of consumers cite color as the primary reason they buy a particular product. Fonts: Serif fonts convey formality, tradition, trustworthiness and strength; sans serif are viewed as more modern and upbeat. Shapes: Circles, ovals and ellipses evoke a positive emotional message implying partnership, stability and endurance. Squares and triangles are associated with power, strength, professionalism and efficiency. Leveraging your brand comes down to one word – visibility. As a friend of ours once said, “No one ever bought anything they never heard of.” So let’s take a brief look at inexpensive ways to raise your visibility quotient. Website: This may be the most expensive of the visibility vehicles, and also the most critical. Know this … if you don’t have a website, you are not perceived as in business. Business Cards: Have your cards professionally printed on quality stock. Print on both sides. Include your tag-line and remember consistency of colors, fonts and logo. Thought Leadership: Here’s a listing of a half dozen +1 ways to demonstrate being a thought leader and industry expert. Public speaking. Host speaking events. Join and participate in social media groups. Seek testimonials and post. Publish a regularly scheduled e-newsletter. Community service. Networking. Click below for articles authored by Top of Mind Communications that address some of the thought leadership strategies. Of all that has been discussed in this article, how many of the above are you doing now? Challenge: Right now, pick 3 that you will start on today. As you build your visibility arsenal, get all your branding pieces in synch. 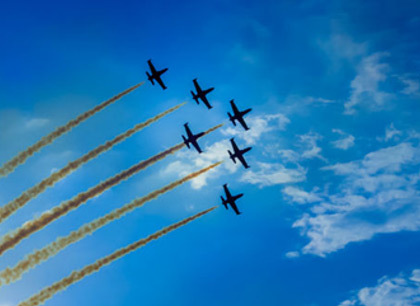 That means consistency of all branded materials and activities … much as getting all aircraft flying in tight formation. Good luck!